I need a better system for tracking these discount books at Amazon. Way I do it now, I just add candidates to my cart whenever I find them. Which means my cart fills up pretty quick, and I have to keep emptying it. Don’t tell me I should create a wishlist. I already have over a dozen wishlists. Compulsive people shouldn’t be allowed to use Amazon. Anyway, what do we have in the bag for you this week? 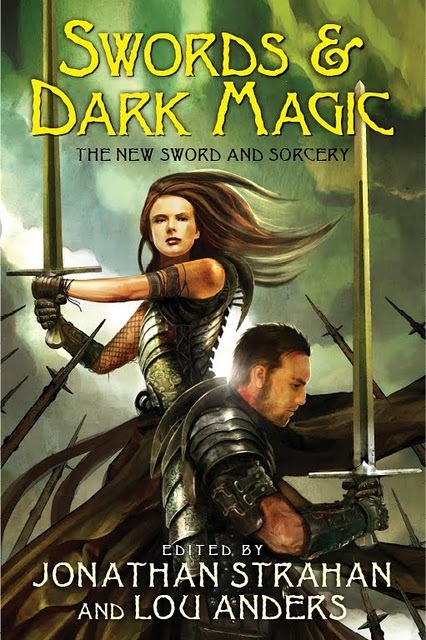 Swords & Dark Magic: The New Sword and Sorcery, the excellent anthology edited by Jonathan Strahan and Lou Anders, has been marked down from $15.99 to just $6.40; David Weber’s new standalone SF novel, Out of the Dark, is just $2.98 in hardcover; and Tanya Huff’s latest hardcover, The Truth of Valor, is just $2.54. All that, plus two novels by Charles de Lint, Spirits in the Wires and Spiritwalk, for roughly six bucks; three Hawkmoon novels by Michael Moorcock for six bucks or less: The Mad God’s Amulet, The Jewel in the Skull, and The Sword of the Dawn; The New Space Opera, volumes One and Two, edited by Gardner Dozois for under 7 bucks; Gene Wolfe’s latest novel, Home Fires, in hardcover for $10; and over a dozen more. Most books are discounted from 60% to 80%. As always, quantities on these bargain books are very limited. All are eligible for free domestic shipping on orders over $25. Many of last month’s discount titles are also still available; you can see them here. Crux is excellent, or at least the version I read in whichever magazine it was originally printed in (F&SF I would guess, because he’s pretty much one of their “staff writers”). And I had “Swords and Dark Magic” on my Amazon wishlist (I’m far too lazy to have more than one), so that one has just been ordered. Glad you snatched SWORDS & DARK MAGIC while there were still copies left! As of this morning, there’s only one copy of CRUX left as well.